Today I received a package from the lovely Kaitlin, who has just turned her hand to creating those fabulously bling tastic phone cases that we all hate to admit we love! 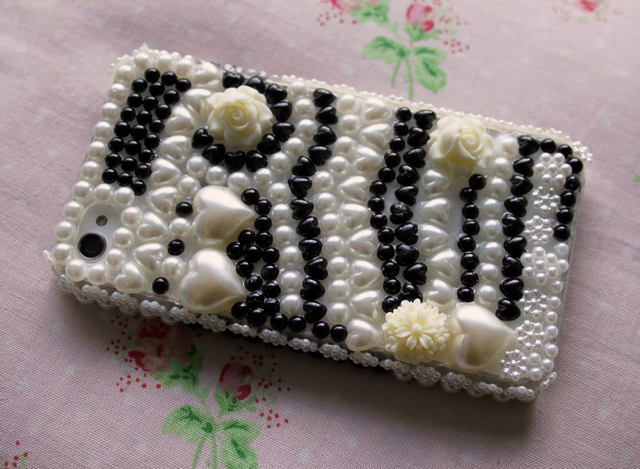 She very kindly offered to make me my own custom case, to which I accepted, having recently got myself a shiny white iPhone! I’m over the moon with the design. Basically, you go over to her Facebook page, and choose the embellishments and colour scheme you want, then she does the rest. I went for a black and white pearl theme, with no large details, but a few small flowers in the same colours, but you can have pretty much anything! Take a look at the order form for the options, or the photos on the page for some inspiration of covers Kaitlin has already worked her magic on. Kaitlin can encrust many different phone types, just check here to see if she can do yours. Prices for a set number of details range from £14 to £16 plus a small postage cost, but she will also do custom designs with price on request. What do you think of my cover? What design would you get? "PINK LIPS & PRETTY SKIRTS"
I recently bought a back-cover for my Blackberry with purple, black and clear rhinestones all over it, haha! I do really want one with the roses, though I just feel they'd get in the way? How are they?